When you have thought you have seen the worst of the roads in Nigeria, it's until when you leave the shores that you will Nigeria is a beautiful place after all. Sometimes driving down the freeway seems like a dangerous thing to do. Accidents could happen, reckless drivers on the lose or animals suddenly pop out of nowhere. It seems like a death-defying act that could give you a heart attack any time. 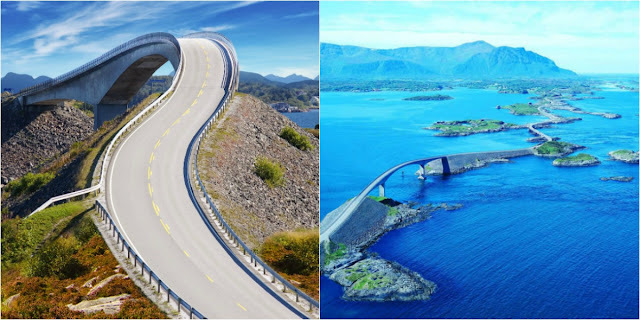 But if driving down the freeway seems like a death sentence to you, wait till you see these most dangerous roads around the world. These drivers must be drunk or just really gutsy to drive these insane roads. These roads also have high death rates. The people who live around these areas depend on these roads for their daily transportation so consider yourself lucky. About 1.3 million people die in traffic accidents every year. The World Health Organization has declared 2011-2021, “A decade of action for road safety.” But while many of those deaths could be prevented by better driving, there are some roads that test the skill, and courage, of any driver. Let’s check them out. At 9045 feet this mountain pass in Northern Italy is the highest paved mountain pass in the Eastern Alps and the second highest in the Alps. How’s that for height? 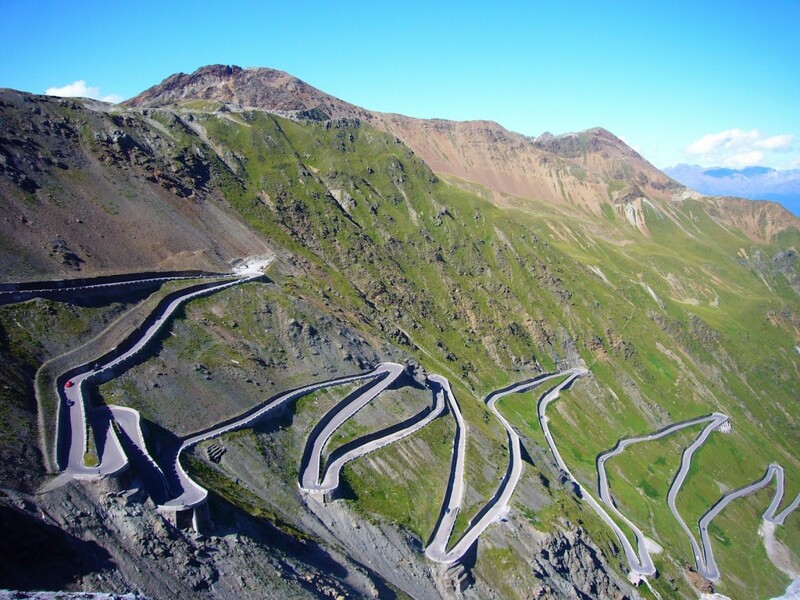 Just looking at this mountain pass will make your stomach turn. The roads looked like it was doodled by a toddler. The road climbs almost two kilometers and, with just a low concrete barrier between you and the steep mountain drop, it’s best not to look down. A bit too much speed on one of the road’s 60 180-degree corners could spell disaster. We’ll take the freeway anytime than this. The Mexican Federal Highway 1 stretches the length of the Baja California Peninsula from Cabo San Lucas, at the southern end to Tijuana in the north. It is often called the Carretera Transpeninsular or Transpeninsular Highway and most of its length have two lanes. Construction was completed in 1973 and its official name is “Carretera Transpeninsular Benito Juarez” or the Benito Juarez Transpeninsular Highway. Named after one of Mexico’s most revered heroes. 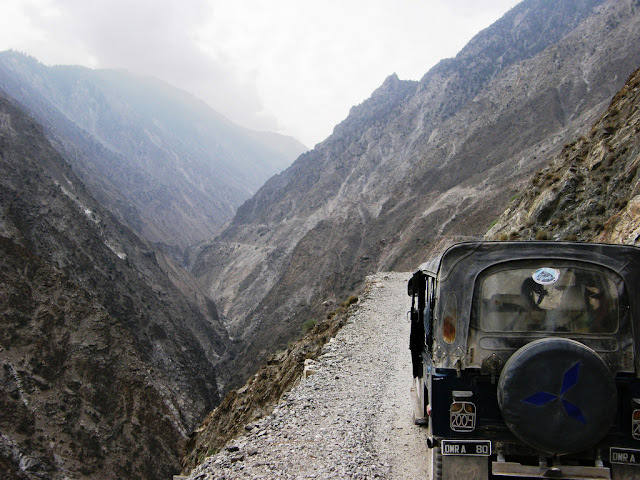 Although not all parts of the highway are life-threatening because of its length, it cannot be avoided that the road would need to pass through mountains. Just like this part. This is definitely more heart pounding than a roller coaster ride. 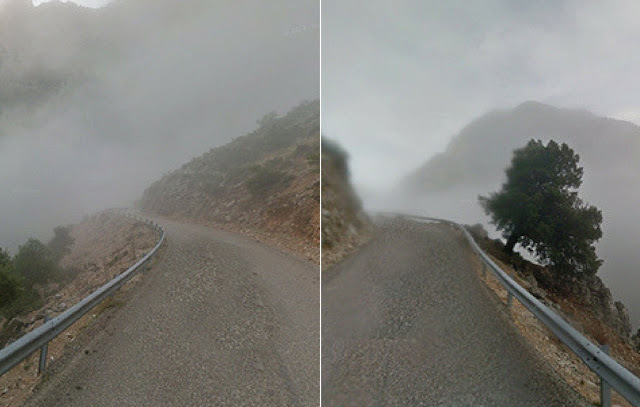 Perdikaki-Patiopoulo is a mountain road found in the northeastern part of Aetolia-Acarnania, Greece. This road is a steep climb and descent. Over the length of the road, the elevation changes nearly 500 meters. It’s full of twists and turns and the road is also incredibly narrow with a sheer drop on the edges with veery low and unstable railings to protect vehicles from falling off the edge. No wonder many people die on the road every year. Without any signs and warnings, judging distance from the edge is extremely difficult and avoiding the drops even in the light of day is hard enough but the problem is even more evident at night when most accidents happen. The area is also prone to heavy mist and fog and can be dangerous in low visibility conditions. With no lights in the dark then this is definitely a recipe for disaster. The Sichuan-Tibet Highway is a high-elevation road that begins in Chengdu of Sichuan on the east and ends at Lhasa in Tibet on the west. The road is 2,142km long. 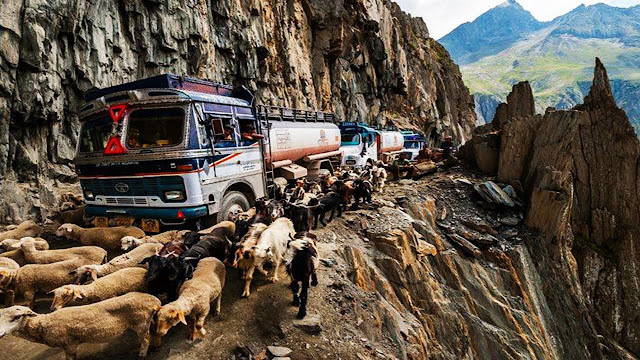 Despite the challenging roadway, it’s a regular route for truck drivers heading to the roof of the world. The Sichuan-Tibet Highway originally called the Kangding-Tibet Highway will take you through wide, open landscapes with majestic peaks almost touching the sky. The plateau areas are peppered with Tibetan houses and an infinite number of yaks. Travelers can enjoy the breathtaking view and changeable scenery ranging from warm spring to cold and snowing winter, which is intoxicating. This climate will be changing in front of you and the trip may take around 15 days if you are not in a hurry. The highway is also infamously known for bad driving surfaces. Driving along single track sections in bad weather can be really challenging to a less experienced driver. Landslides and rock avalanches are also common. The road is not paved which makes it a mud trap during the rainy season. The real danger is not in getting stuck in the jam but in the hostilities that come up among bored drivers stuck in the mud for weeks. There are constant fights, theft, harassment, and even kidnappings for money. Although this is not a mountain road it’s dangerous for a reason. It is called Highway 431 or U.S. Rote 431 but has since been nicknamed the “Highway to Hell” due to the number of accidents that happens here. People believe it is one of the most dangerous in the world and causes the 4th most amount of deaths compared to any other road in America. It is said its main problems are poor visibility and lanes that reduce without any warning. That’s why people believe it is one of the most dangerous in the world and causes the 4th most amount of deaths compared to any other road in America. It is said its main problems are poor visibility and lanes that reduce without any warning. I think I’ll stick driving in the freeway. We all know how powerful and majestic the Atlantic Ocean is. But did you know that you can drive across the ocean? The route was originally proposed as a railway line in the early 20th century, but this was abandoned. Now this highway is probably ok to drive on when the conditions are right. But it is stormy it is probably best to find another route. Just imagine the huge waves smashing on the road. You wouldn’t want to get wiped out in the Atlantic Ocean, wouldn’t you? The road is now preserved as a cultural heritage site and is classified as a National Tourist Route. It is a famous site to film automotive commercials and has been declared the world’s best road trip. The road opened back in July 1989. Here is another mountainside road and another opportunity for brave men to cheat death. Even the best drivers in the world would have a hard time going through this one. Now if the road isn’t dangerous enough, the herd of sheep and goats make this drive even more difficult. It’ll take forever for these animals to clear the road. And you wouldn’t want to drive at night on this place. There are no lights, railings, and warning signs. Anything could happen and the hospital is way far off. No thanks, but I think I’ll pass this area. Unless someone airlifts to this place. This highway here looks like something out of a dream. Only in your dream, you don’t have to worry about driving right off the road. Just make sure all the beauty does not distract you as you drive. Aside from the height, the twist and turns of this road make this even more difficult. Tourists can also walk on kilometers of paths built onto the cliff face at the top of the mountain, including sections with glass floors. A large temple is also located on the summit with a chairlift or footpath access. The original temple here was built in the Tang Dynasty. 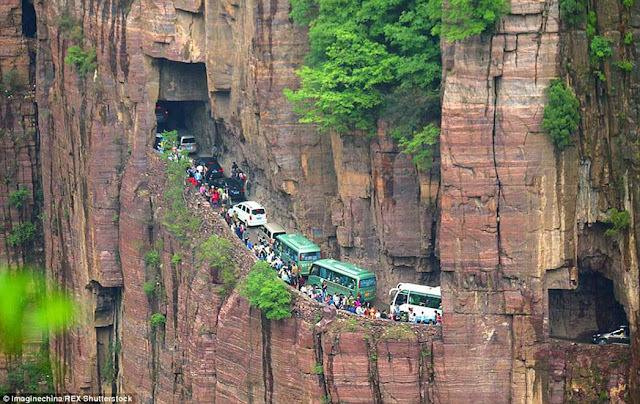 Impossible to even imagine the most dangerous traffic jam than that in the mountain. This road is called “The road 13 heroes”, in honor of the 13 men who were able to build such a dangerous route on the steep mountain with 5 years of hard work. All this effort in order to make a road leading to their small village. The road is a continuous tunnel with 35 windows and is about 1250 meters long. The work was not only difficult but also very dangerous. Some of the villagers died because of accidents during construction. At one point a small village was cut off from the outside world. Now there are thousands of tourists! The village became a jewel of the local mountains because of its unique landscapes and this truly grand tunnel. The Eshima Ohashi Bridge or Roller Coaster Bridge as it is fondly called is a rigid-frame bridge in Japan that connects Matsue Shimane Prefecture and Sakaiminato, Tottori Prefecture over Nakaumi lake. It was built from 1997 to 2004. It is the largest rigid-frame bridge in Japan and the third largest in the world. Images of the bridges have widely circulated on the internet, due to it appearing very steep from a short distance. But in reality, it isn’t as steep and it depends on the side you are viewing.These cars don’t seem to mind at all. Driving that bridge would definitely be an experience. 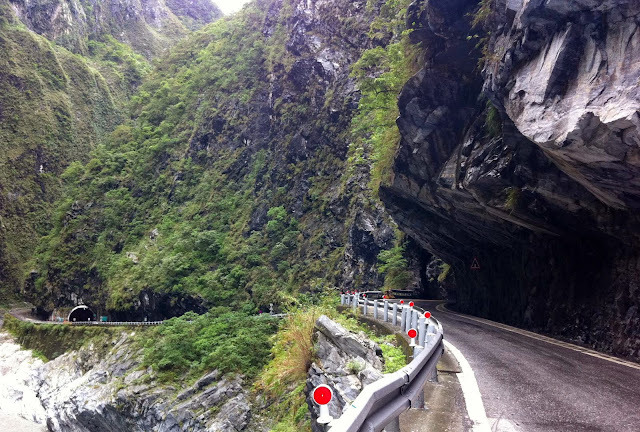 The Taroko Gorge Road in Taiwan is another mountain route made by carving out rocks. It is a narrow and winding mountain road, and only a bus can barely pass by at a time. 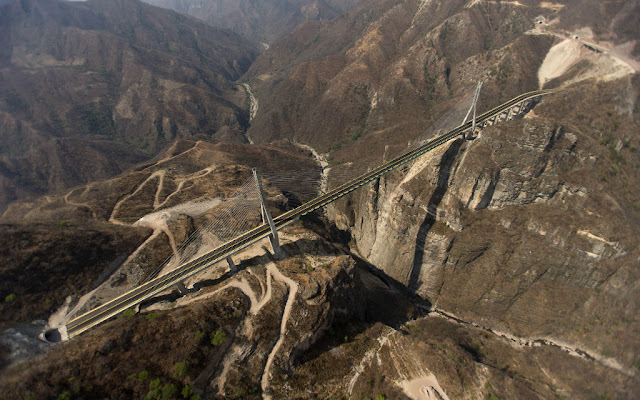 But the highway itself is truly an engineering masterpiece, as it cuts through the mountains. It’s full of blind curves, sharp turns, and narrow paths leading through cliffs and mountains. 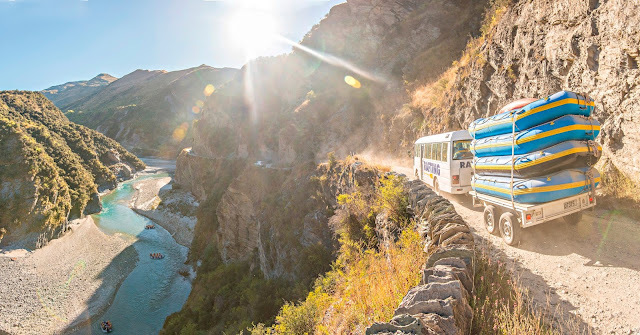 The road passes through the Taroko national park alongside the Taroko Gorge and is an appeal to the tourist, as well as a mode of transportation of marble found abundantly in Gorge. In addition, there are pedestrians, scooters, cars and massive tour buses all vying for the tight space. This narrow mountain road offers spectacular views for brave drivers. This road tests the skill, and courage, of any driver. It’s definitely not for anyone suffering from vertigo or a fear of landslides. Once a busy gold mining area, Skippers Canyon was accessed by Skippers Road, which is today one of New Zealand’s better known scenic roads. The main New Zealand road where rental car insurance is not honored if driven on because Skippers Road is mostly one-way, narrow and steep with sheer drops of several meters. Even the insurance companies are wise enough. Pakistan is not the top pick in countries to visit for most people for many reasons, but if you do end up there avoid this road. Fairy Meadows sounds pleasant enough but do not let the name fool you. The road should be avoided at all costs as the gravel road is not maintained at all. Many people have driven off the road to their deaths. As you can see in the photo. Fairy Meadows was named by German climbers and is locally known as Joot. It is a grassland with an altitude of about 3,300 meters above the sea level, it serves as the launching point for trekkers summiting on the Rakhiot face of the Nanga Parbat. In 1995, the Government of Pakistan declared Fairy Meadows a National Park. There’s no fairy in here. 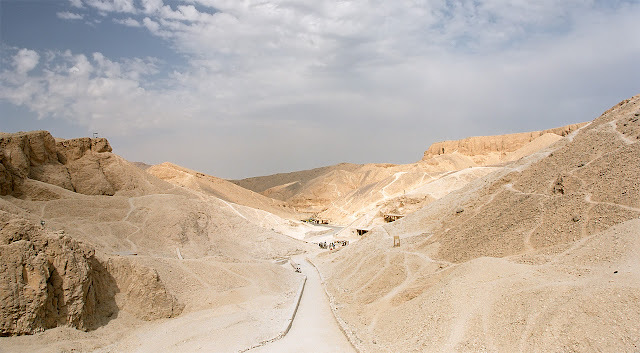 The road that connects the ancient city of Luxor in southern Egypt and Hurghada, the regional hub for several scuba diving resorts on the Red Sea, is a death trap. It’s extremely dangerous with many head-on collisions and fatal accidents due to drivers not turning on their head lights. The reason for drivers keeping their lights off is because bandits and terrorists patrol the roads and shoot drivers. On this road between these 2 touristic centers, bandits, terrorist attempts to undermine the tourism industry, and frightened drivers have all combined to turn this asphalted road into a major nightmare. The violent attacks along this road are dangerous enough by themselves. And if the bandits don’t get you, the terrorists probably will. Uh-oh. Halsema Highway or also known as the Benguet-Mountain Province Road, Baguio-Bontoc Road or Mountain Trail is a national highway in the Philippines. Situated within the Cordillera Central range in northern Luzon, it stretches from the city limit of Baguio to the municipality of Bontoc. At its highest point at 7,400 feet above sea level in the municipality of Atok, it is the highest altitude highway in the Philippines. Many roads in the Philippines could easily make the list, especially when compared to all roads around the world. 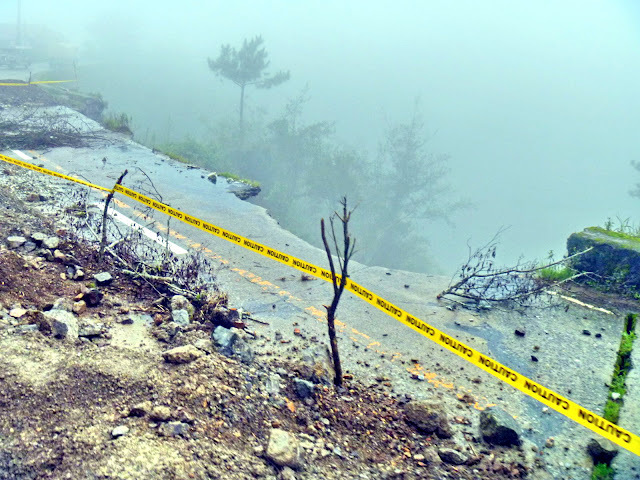 The Halsema Highway is particularly bad and considered to be very dangerous. Even the most skilled drivers try to avoid this one. This road reaches 7400 feet above sea level so riding on this broken down highway could be fatal. Now that you’ve seen some of the world’s most dangerous roads the freeway doesn’t seem so bad at all. Aren’t you glad you don’t have to drive through those dangerous roads? If an accident won’t kill you then a heart attack probably will. I expected Nigeria to occupy like 8 spots, but it's understandable they didn't. Na mountain roads full here. 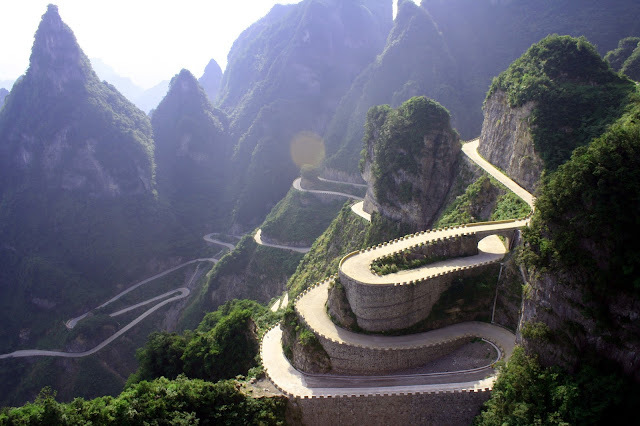 The road up the mountain (Obudu Cattle Ranch)looks similar to this, only the brave can drive up that mountain. Even when you gather morale drive up, you enter a cable car and look down on what you drove through : to drive down fit come hard. All this roads are for tourism, when it comes to death trap roads, they should come to naija. Abuja - Kaduna Highway no follow? The road that leads to Obudu plateau is also dangerous. where is ayingba to ankpa road? I don drive pass dia. I was expecting to see something like apapa- tincan type of road where trucks fall everyday. ok na, atleast they are dangerous due to the topography of the earth surface in that area, unless here in Nigeria where you have deadly roads as a result government incompetence. All this oyinbo people dey think life started and finished on thier lands. Op, add East-west road in Nigeria. Except for that Halsema, the rest you just need not speed and drive as far away as possible from the edge. Op 15 and 11 pics are the same. please somebody should see governor Ortom dressing, native cap on suit sorry I mean coat. But Ortom weytin we do you? that you having choose to disgrace us upandan? That List is not complete without Lagos Ibadan Express Road. 1 week 1 Accident.